The pumpkin is cooked and the chestnuts are peeled; the turkey is dry brining in the fridge; I’m getting ready for Thanksgiving! It’s my favorite holiday – loved ones around the table, good food atop it, and a chance to reflect on all that we have to be thankful for. 1. Cut the chestnuts in half with my biggest sharpest kitchen knife. While bringing a pot of water to a rolling boil. 2. 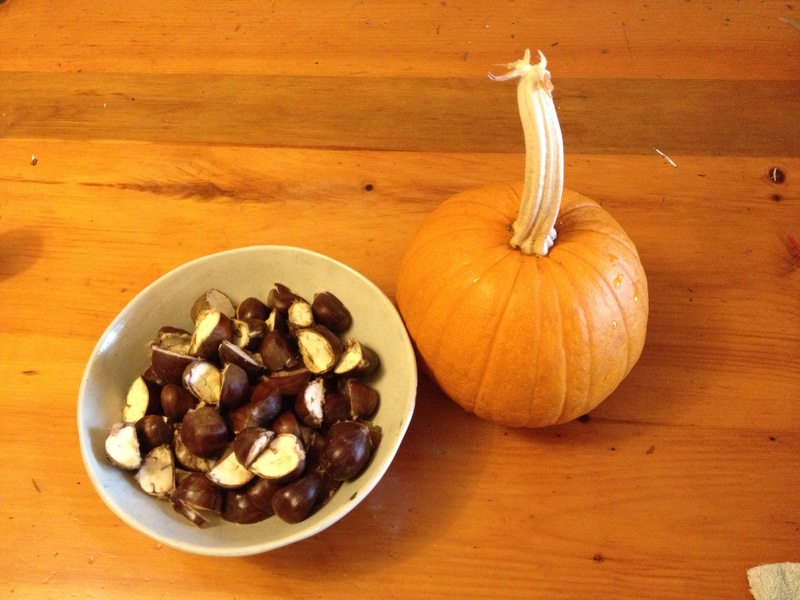 In batches, parboiled the chestnuts for two minutes. 3. Used pliers to squeeze the chestnuts out if their shells. It is worth looking at the video to get a sense of what you need to do (it is less than a minute long). 4. Finished cooking the chestnuts in the oven. It was so easy and, most importantly, painless! Aha – cut them completley in half and not just slit them – makes sense! It seems so obvious, I don’t know why I never thought to do it this way before. Next year, Siobhan, this is what I will do! Our preparations are going along well too. We’ll have about 9 folks for turkey and so forth. We dry brine too. Happy Thanksgiving to everyone! Our table is pretty underpopulated this year, but hopefully that just means lots of good leftovers. Happy Thanksgiving! I will do this next year, Siobhan – you’re right about those hot chestnuts; they are a big remembrance of our youth! Our Thanksgiving preparations are going well too. We also like to dry brine. Happy Thanksgiving! This is my first time dry brining (or doing a turkey at all on my own). Fingers crossed… Happy Thanksgiving! I wish I had seen this earlier. I roasted my chestnuts before peeling them and it took forever. Next time I make stuffing, I’ll be giving this method a try. Thank you so much for sharing. I hope you and your wonderful family had a Happy Thanksgiving, Siobhan. Unfortunately, I do things at the last minute, but as I was posting this I kept thinking of how I ought to have done it earlier… Never mind, next year can be the start of a new era — I, for one, am never looking back (this is my first Thanksgiving without aching fingers and thumbs). Hope you had a wonderful Thanksgiving!